Cherokee Short Sleeve Unisex Medical Scrub Top Dolman sleeve, v-neck tunic with side seam vents, two patch pockets and a cell phone pocket. This Dickies Medical Scrub Dress is comfortable, durable and professional. This scrub dress is perfect for at work, or school. This Dickies Medical Scrubs Lab Coat is comfortable, durable and professional. It is perfect for school or work. 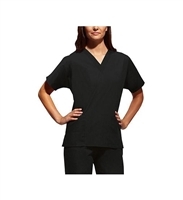 Dickies Short Sleeve Medical Scrubs Top available in many sizes and colors. Dickies Unisex Short Sleeve Medical Scrubs Top for school or work. Available in many sizes and colors. Lightweight and durable, this Dickies V-Neck Medical Scrub Top is perfect for the office or school.